MOSCOW - Russia tested new missiles Tuesday that a Kremlin official boasted could penetrate any defense system, and President Vladimir Putin warned that U.S. plans for an anti-missile shield in Europe would turn the region into a "powder keg." "As of today, Russia has new tactical and strategic complexes that are capable of overcoming any existing or future missile defense systems," Ivanov said, according to the ITAR-Tass news agency. "So in terms of defense and security, Russians can look calmly to the country's future." Ivanov is a former defense minister seen as a potential Kremlin favorite to succeed Putin next year. Both he and Putin have said repeatedly that Russia would continue to improve its nuclear arsenals and respond to U.S. plans to deploy a missile defense system in Poland and the Czech Republic — NATO nations that were in Moscow's front yard during the Cold War as Warsaw Pact members. America's veterans are the face of America. They come from all walks of life, all ages, all ethnicities. They served our Nation honorably and well and we honor that service, but how do we honor the veteran – the individual who put on the uniform and gave his or her all for our country? In the spring of 2006 I had the privilege of attending the ANZAC (Australian and New Zealand Army Corps) Day ceremonies in Sydney, Australia. ANZAC Day is the most important national holiday in Australia, a combination of Memorial Day and Veterans Day. It was established to commemorate the more than 8,000 Australians killed in the battle of Gallipoli in World War I, and now honors all Australian and New Zealand veterans. That is why I am calling on America's veterans to wear their military medals on Veterans Day, Memorial Day and the Fourth of July. Wearing their medals demonstrates the deep pride our veterans have in their military service and reminds all American citizens of the sacrifices our veterans have made. Veterans, wear your pride on your left side on patriotic holidays! Let America know who you are and what you did for freedom. The US is increasingly concerned about China’s deployment of mobile land and sea-based ballistic nuclear missiles that have the range to hit the US, according to people familiar with an imminent Pentagon report on China’s military. The 2007 Pentagon China military power report will highlight the surprising pace of development of a new Jin-class submarine equipped to carry a nuclear ballistic missile with a range of more than 5,000 miles. Washington is also concerned about the strategic implications of China’s preparations later this year to start deploying a new mobile, land-based DF-31A intercontinental ballistic missile that could target the whole US. Labels: Nuclear preparedness, Political realities, Why prepare? The age of celebrating heroes is past. However, acts of heroism remain part of the human condition. The disconnect is, of course, in the telling of the story. Monumental sacrifice and selfless concern for others remain real human phenomena. Soldiers, law enforcers, health professionals, rescue personnel, and everyday people thrust into critical situations regularly prove (often without recognition) to be made of the right stuff. However, the rise and dominance of cynicism in the media is a tall obstacle to showcasing heroic behavior to the public ... in a fashion that adequately models the best that can presumably be found in each of us. That carries a disturbing implication for the future. But with or without recognition of unusual acts of prowess, the elemental core of the make-up of humankind carries us forward. Heroic leaders and followers guide society through and past roadblocks that would otherwise turn us back. Heroic callings are almost always unexpected. However, that is not to say that some level of preparatory foundation should not be put into place individually if there is any desire at all to stand tall in the face of disaster. Heroism in the classical sense demands a strong moral platform. Bravery and honor emerge out of a sound training of the soul. Generosity beyond self regard is often necessary, but is today perhaps rarest of all the measures of the truly dauntless spirit. The ingrained ability to resist fear is not a common trait. But it is my belief that there is a significant, quiet segment among those who physically prepare for disaster who are in position and who are ready to deliver with conspicuous courage when called upon. I hope we all can do a bit more to encourage the development of lion-hearted preparedness across our great country. The need for heroes will never go away. Food Locker Load-up Sale Open to the Public; Buyers Club Membership Free-for-All!! Been working on some new things for our buyers club ... new products, suppliers, etc. Now we're up and running on the first new development in a couple of months--the introduction of several new top-quality, tasty emergency storage food products, as well as the next installment of our famous 3-case MH buy. In celebration, for a short time, we're opening up sales of ALL our food listings to the public at 20-23% OFF listed prices plus FREE shipping on everything. These orders ship right away. Discounted prices = 20% off listed prices after using coupon (see below), with free shipping. See these new listings. We're also now offering our ever-popular Mountain House 3-case, 18-can/18 variety kit for the next few weeks. It is a group buy that we aim to close and do a bulk buy of all the foods for in early June. Deliveries should take place by the end of the month. See the 3-case listing. 3. All other listed foods in the club are now open at club-discounted pricing for a very short time. Most all of it ships right away. Mountain House, Honeyville, MREs, and much more. 4. Lastly, on top of opening up our club prices to the public for the first time, we are also presenting lifetime club memberships to anyone making a food purchase of at least $100 during this sale. So if you are not a member yet, now's the time to get on board. If you are already a member, and you make a qualifying food purchase, you can award your complimentary membership to someone else as a gift. LOADUP20 - use this code in the coupon space on the payment page of the checkout in our online store when you are making any other (non-Mountain House) food purchase of at least $100. Or call us toll-free with your order info at 1-877-673-2394. Labels: Nuclear preparedness, Terror preparedness, War on terror, Why prepare? Chaos gripped the streets of Karachi yesterday as gun battles left at least 31 people dead and hundreds more injured, threatening a complete breakdown of law and order in Pakistan's largest and most volatile city. 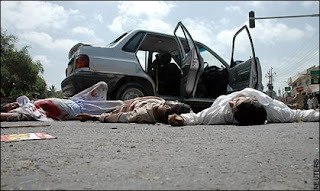 With plumes of black smoke billowing over the city of 12 million people, there were extraordinary scenes as gunmen on motorbikes pumped bullets into crowds demonstrating against Pakistan's President Pervez Musharraf, while police stood by and watched. In images more reminiscent of Baghdad, bloodstained corpses lay where they had fallen in the streets and bodies piled up in hospital morgues. As the sense of crisis deepened, a crisis meeting between Gen Musharraf and the prime minister, Shaukat Aziz, resolved to send in paramilitary troops to restore order, and to place the army on standby. The men agreed that a state of emergency would be imposed if the first two options failed. It was the bloodiest escalation of the two-month long saga which began when the president attempted to sack the country's chief justice in March. The ensuing challenge by lawyers and opposition parties to Gen Musharraf's eight-year rule has left the president - a key Western ally in the "war on terror" - desperately clinging to power. Labels: Nuclear preparedness, Political realities, Terror preparedness, War, War on terror, Why prepare? Government Initializing Emergency Survival Program for Nuclear Terror--New Civil Defense Fallout Shelters? As concerns grow that terrorists might attack a major American city with a nuclear bomb, a high-level group of government and military officials has been quietly preparing an emergency survival program that would include the building of bomb shelters, steps to prevent panicked evacuations and the possible suspension of some civil liberties. Many experts say the likelihood of al Qaeda or some other terrorist group producing a working nuclear weapon with illicitly obtained weapons-grade fuel is not large, but such a strike would be far more lethal, frightening and disruptive than the attacks of Sept. 11, 2001. Not only could the numbers killed and wounded be far higher, but the explosion could, experts say, ignite widespread fires, shut down most transportation, halt much economic activity and cause a possible disintegration of government order. The efforts to prepare a detailed blueprint for survival took a step forward last month when senior government and military officials and other experts, organized by a joint Stanford-Harvard program called the Preventive Defense Project, met behind closed doors in Washington for a day-long workshop. The session, called "The Day After," was premised on the idea that efforts focusing on preventing such a strike were no longer enough, and that the prospect of a collapse of government order was so great if there were an attack that the country needed to begin preparing an emergency program. One of the participants, retired Vice Adm. Roger Rufe, is a senior official at the Department of Homeland Security who is currently designing the government's nuclear attack response plan. The organizers of the nonpartisan project, Stanford's William Perry, a secretary of defense in the Clinton administration, and Harvard's Ashton Carter, a senior Defense Department official during the Clinton years, assumed the detonation of a bomb similar in size to the weapon that destroyed Hiroshima in World War II. Such a weapon, with a force of around 10 to 15 kilotons, is small compared with most Cold War-era warheads, but is roughly the yield of a relatively simple bomb. That would be considerably more powerful and lethal than a so-called dirty bomb, which is a conventional explosive packed with some dangerous radioactive material that would be dispersed by the explosion. The 41 participants -- including the directors of the country's two nuclear weapons laboratories, Homeland Security officials, a number of top military commanders and former government officials -- discussed how all levels of government ought to respond to protect the country from a second nuclear attack, to limit health problems from the radioactive fallout and to restore civil order. Comments inside the session were confidential, but a number of the participants described their views and the ideas exchanged. A paper the organizers are writing, summarizing their recommendations, urges local governments and individuals to build underground bomb shelters, much as people did in the early days of the Cold War; encourages authorities who survive to prevent evacuation of at least some of the areas attacked for three days to avoid roadway paralysis and damage from exposure to radioactive fallout; and proposes suspending regulations on radiation exposure so that first responders would be able to act, even if that caused higher cancer rates. "The public at large will expect that their government had thought through this possibility and to have planned for it," Carter said in an interview. "This kind of an event would be unprecedented. We have had glimpses of something like this with Hiroshima, and glimpses with 9/11 and with Katrina. But those are only glimpses." Perhaps the most sobering issue discussed was the possibility of a chaotic, long-term crisis triggered by fears that the attackers might have more bombs. Such uncertainty could sow panic nationwide. "If one bomb goes off, there are likely to be more to follow," Carter said. "This fact, that nuclear terrorism will appear as a syndrome rather than a single episode, has major consequences." It would, he added, require powerful government intervention to force people to do something many may resist -- staying put. Fred Ikle, a former Defense Department official in the Reagan administration who authored a book last year urging attack preparation, "Annihilation from Within," said that the government should plan how it could restrict civil liberties and enforce a sort of martial law in the aftermath of a nuclear attack, but also have guidelines for how those liberties could be restored later. That prospect underscored a central divide among participants at the recent meeting, several said. Some participants argued that the federal government needs to educate first responders and other officials as quickly as possible on how to act even if transportation and communication systems break down, as seems likely, and if the government is unable to issue orders. "There was a clear consensus that a nuclear bomb detonated in the United States or a friendly country would be an earth-shaking event, and we need to know how we will respond beforehand," said Ikle. "I wish we had started earlier, because this kind of planning can make an important difference." But others said the meeting made it clear that the results of any attack would be so devastating and the turmoil so difficult to control, if not impossible, that the lesson should have been that the U.S. government needs to place a far greater emphasis on prevention. "Your cities would empty and people would completely lose confidence in the ability of the government to protect them," said Steve Fetter, dean of the School of Public Policy at the University of Maryland. "You'd have nothing that resembles our current social order. I'm not sure any preparation can be sufficient to deal with that." Fetter added, "We have to hold current policymakers more responsible" for taking all out measures to prevent a nuclear attack. Raymond Jeanloz, a nuclear weapons expert at UC Berkeley and a government adviser on nuclear issues, said that California might be better prepared than most states because of long-standing plans for dealing with earthquakes and other natural disasters. Those plans, he said, could be a useful model for first responders. He added, as others did, that the dislocation and panic caused by a nuclear strike could make any responses unpredictable. "The most difficult thing is the fear that this kind of planning, even talking about it, can cause," Jeanloz said. Michael May, a former director of the Lawrence Livermore National Laboratory, defended the survival planning, saying that people should get used to the idea that such a crisis, while dire, could be managed -- a key step in restoring calm. "You have to demystify the nuclear issue," said May, who now teaches at Stanford's Center for International Security and Cooperation. "By talking about this, you take away the feeling of helplessness." Labels: Nuclear preparedness, Radiological preparedness, Terror preparedness, War on terror, Why prepare? The normally ever-rising cost of food should be a large factor in your decision. Inflation makes purchases of emergency storage food a no-brainer, even if some folks think that the price today of freeze-dried food has a premium attached to it. Compared to store-bought canned goods, the freeze-dried premium is minimal. BUT, when you consider the difference in storability, freeze-dried and dehydrated foods end up being far cheaper. And that is even without factoring in potential crisis-driven leaps in food prices. What do you think will happen to food prices if there is any disruption to the long supply chain? You invest in paper and hard goods with the hope that some day your original money will have grown as it works in that investment. The thing is, those types of investments may not be worth a thing to you in a worst-case scenario. But if you diversify a little of your investment dollar in long-term edibles, how can that possibly go wrong? "Household Preparedness Levels Suffer as the Memory of Katrina Dims"
This is our news release posted today on PR Web. Minneapolis, MN (PRWEB) May 4, 2007 -- Recent pain from disasters such as 9/11 and Hurricane Katrina is a fading memory, as is the urge to prepare for future crises. Safecastle issues a pre-hurricane-season reminder that catastrophe seldom allows adequate time to brace for impact. Now is the time to take stock and prepare, taking advantage of the new Safecastle Royal Buyers Club discounted preparedness offerings. "Public awareness is unprecedented," offered Victor Rantala, Safecastle LLC. "However, translating that into action is where we are again lagging." What did it take to draw people's attention in the 21st century to the need for crisis preparedness? "Nothing less than a series of large natural disasters and their frightening aftermaths, looming potential threats of pandemic and terror attacks, simmering international tensions, and consistent government exhortations to take steps toward personal readiness," he replied. "Yet, in spite of the knowledge that personal readiness is needed more than ever today, a majority of U.S. families and businesses remain inadequately prepared to vitally sustain members through short, post-disaster recovery periods." Said Rantala, "We at Safecastle continuously aim to help remedy that situation. Now we are pleased to be publicly offering a new preparedness buyers club with a lifetime membership that brings the cost of virtually all emergency preparations well within the reach of Americans everywhere." The U.S. Department of Homeland Security has a website - http://www.ready.gov - which the agency recommends a basic disaster preparedness plan and on-hand supplies that can sustain a household for a minimum of three days. That goal is very modest and easily attainable. However, various surveys indicate household readiness is actually decreasing as time passes since Hurricane Katrina. "Americans have short memories when it comes to negative experiences," said Rantala, the owner of crisis-preparedness provider Safecastle LLC. "Rebounding from a knockdown can pay off in recuperative energy that helps us emerge and grow out of our setbacks. But it also can cause us to have to needlessly suffer again when we don't apply and live out past lessons learned. As a nation, we have to be able to watch and learn from the traumas and react accordingly, even when we haven't been directly impacted as yet by such a disaster." As outlined by the Department of Homeland Security website, the most basic life-sustaining needs include non-perishable food, clean water, a way to ensure breathable air, and warmth. Of course, there are many other simple items to supplement those basic needs that can greatly improve an individual's or group's ability to cope with and recover from catastrophe. Said Rantala, "An acceptable level of preparedness is well within reach for almost everyone. It really doesn't take much to be physically positioned for a wide range of potential threats to our usually safe and comfortable lifestyle. "Good insurance coverage on home, auto, life, and health is a necessity for negotiating life's ups and downs," he pointed out. "Such coverage is not cheap, but we are willing to foot the bill for that kind of peace of mind. However, most folks today are perfectly aware that insurance is not the whole answer. The aftermath of Hurricane Katrina, in particular, has plainly brought home that knowledge. "We also know that government agencies and relief groups, as hard as they try, often cannot fill in the gaps and answer all the urgent calls for help in a large-scale crisis, nor can we count on them to be there for us at the most critical moment immediately after a catastrophe." "Clearly, events such as Hurricane Katrina and the Asian Tsunami, as well as recent California earthquakes, regional power blackouts, and the terror attacks of 9/11 provide memorable lessons," Rantala said. "The bottom line is that we as individuals need to be equipped to react in a meaningful way, in order to save ourselves and those near and dear to us if we find ourselves in the crosshairs of a disaster in the making. "We need to be reminded today, especially as hurricane season again approaches--the time to prepare is before the crisis erupts. Indifference to possible risk and danger is a killer. The greater our ability to be resilient and self-reliant in times of trouble, the better off we are when the worst day of our life suddenly dawns." Safecastle is a growing force in the emergency preparedness marketplace, providing concerned citizens and businesses with consulting services, educational insights, and quality product offerings and service for increasing emergency readiness levels. Safecastle product lines include 90-year prefab steel shelters and safe rooms, long-shelf-life emergency foods, water purification and storage products, security items, and more. BELTSVILLE, Md. — Unless someone or something stops it soon, the mysterious killer that is wiping out many of the nation's honeybees could have a devastating effect on America's dinner plate, perhaps even reducing us to a glorified bread-and-water diet. Honeybees don't just make honey; they pollinate more than 90 of the tastiest flowering crops we have. Among them: apples, nuts, avocados, soybeans, asparagus, broccoli, celery, squash and cucumbers. And lots of the really sweet and tart stuff, too, including citrus fruit, peaches, kiwi, cherries, blueberries, cranberries, strawberries, cantaloupe and other melons. Even cattle, which feed on alfalfa, depend on bees. So if the collapse worsens, we could end up being "stuck with grains and water," said Kevin Hackett, the national program leader for USDA's bee and pollination program. "This is the biggest general threat to our food supply," Hackett said. While not all scientists foresee a food crisis, noting that large-scale bee die-offs have happened before, this one seems particularly baffling and alarming. U.S. beekeepers in the past few months have lost one-quarter of their colonies — or about five times the normal winter losses — because of what scientists have dubbed Colony Collapse Disorder. The problem started in November and seems to have spread to 27 states, with similar collapses reported in Brazil, Canada and parts of Europe.